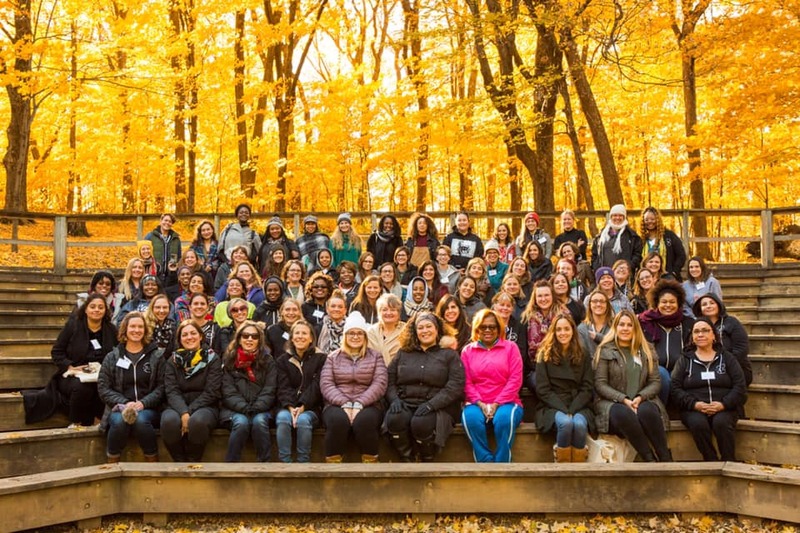 From October 19-21 this year, a retreat sponsored by Minnesota Prison Doula Project took place in an exquisite wooded setting near a very blue lake. It was a remarkable and transformative experience. Nearly a hundred women were there, most of them doulas, and all of them committed to working with incarcerated female populations. The attendees came from many different parts of the country and even from Mexico. One outstanding session was a panel of men and women who recounted personal experiences of incarceration, with an emphasis on the experience of black and brown folks. Other great sessions focused on the elements of starting and running a program of doula support within jail or prison, with special emphasis on trauma informed care, the culture and nature of Department of Corrections, how to get and sustain funding for various parts of the work, such as paying staff and running lactation programs , and lastly how to collect data and look at data to improve and inform the work. Without a doubt the most special part of the weekend was meeting and talking to so many of the attendees. What a remarkable group of women! I felt as if I were truly home amongst dear friends who would be lifelong advisors and colleagues. The convening in Minnesota was amazing! The formerly “national” network of prison doula projects has become international. And we are still growing! Since this long weekend my brain has been going at warp speed, because I met so many extraordinary people and learned SO much - in such a condensed time period. People enthusiastically shared their wisdom, their expertise, their passion, and their open hearts. I’m still processing. Although I've gathered many doula stories and quotes over the past 20 years of working with doulas (including creating a collection called “Sharing Our Stories”, a true “labor of love”), I heard stories in Minnesota from women who gave birth while incarcerated and from some of their doulas that were the most illuminating I've ever heard. And I was grateful for the opportunity to share an update about the IBJ website’s ever-expanding resources (videos, podcasts and radio shows, webinars, links to key websites and organizations) and ~ 450 articles (and growing) on a broad range of topics. I can’t wait for the next gathering! I was rejuvenated by the doulas and their determination to make a difference in the lives of women and children. Doulas have a huge impact the world over. The Minnesota Prison Doula Project has blazed the trail for doulas to successfully help families. The National Prison Doula Training was a transformative experience for me! Not only did it solidify my desire to pursue doula training after the completion of my graduate studies in maternal and child health, but it reignited my passion for anti-racist work. It is often very easy for me to feel stifled and repetitive in my work being in the academy, and being surrounded by so many radical, on-the-ground femmes from across the globe who have been steeped in the work-- living it-- in various ways and periods of time humbled me, challenged me, and called me to do better. Centering the voices of indigenous people and incarcerated mothers was of particular importance to this training; I think a lot of young people like me who may feel called to this work right now do so because maternal incarceration is a "hot button" issue, without ever really having critically engaged with the people and families who are most heavily impacted by mass incarceration and systemic racism. Sharing space with these people, hearing their stories, and establishing meaningful relationships with them was an important step for me as a public health practitioner and as a compassionate human being who wants to see positive systemic change. I'm glad I got the opportunity to be challenged, flex my creative thinking muscle, and foster new friendships over this unforgettable weekend. No one births alone! !